Dalkey Archive Press, 9781564782267, 192pp. "The Terrible Twos" is a wickedly funny, sharp-edged fictional assault on all those sulky, spoiled naysayers needing instant gratification--Americans. 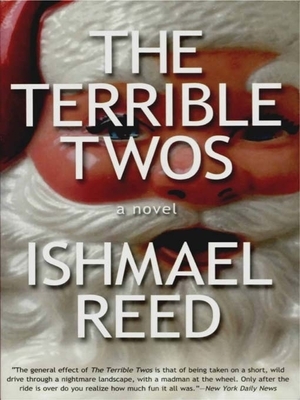 Ishmael Reed's sixth novel depicts a zany, bizarre, and all-too believable future where mankind's fate depends upon St. Nicholas and a Risto rasta dwarf named Black Peter, who together wreak mischievous havoc on Wall Street and in the Oval Office. This offbeat, on-target social critique makes marvelous fun of everything that is American, from commercialism to Congress, Santa Claus to religions cults.